The term ”Barb” is loosely used to describe a wide range of different fish species in the aquarium trade. The true barbs are the only species found in the genus Barbus, in the family Cyprinidae. Most members of the Barbus genera have a pair of barbels on their mouths, which are used to search for food on the bottom. 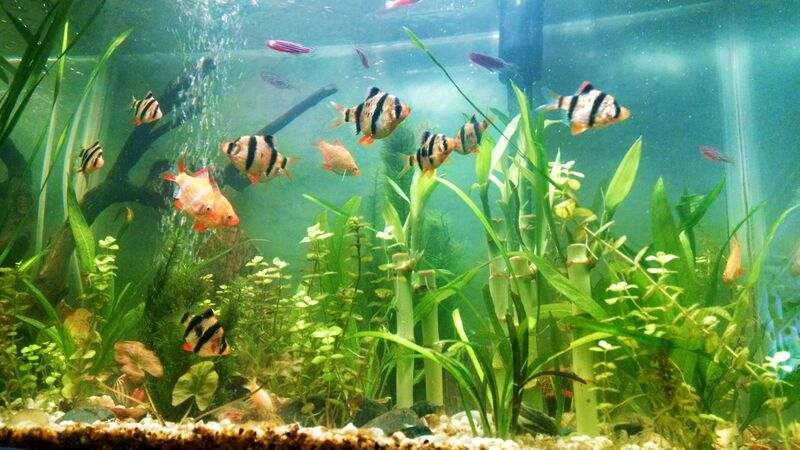 Most all Barbs are small, lively, colorful, hardy fish that do well in community aquariums. They are a peaceful to semi aggressive schooling species that do best when kept in groups of at least six or more individuals. When kept separately, they tend to become more aggressive towards their tank mates and can become fin nippers. When considering this family of fish for your freshwater tropical fish aquarium, keep them with other barbs or species that can tolerate highly active, semi aggressive behavior. Do not place them in with slower moving long finned fish like some tetras or Bettas. Most barbs prefer well aerated, soft acidic to neutral water that is on the cooler side of the tropical fish spectrum. When setting up your aquarium for barbs, try to mimic their natural environment. Include plenty of plants, especially some floating plants, but don’t crowd your tank. Give them enough room to swim and roots, rocks, or water logged wood to hide around. Barbs are naturally shy fish and do not like strong direct light. Barbs will readily accept most types of food when in captivity. They are omnivorous and should be fed a mixed diet of meat and vegetable based food flakes. An occasional treat of brine shrimp or daphnia will keep them healthy in your tank.